It’s no secret that the demands of a career in the beauty industry can take a toll on your body. Stylists spend most of the day on their feet, with arms lifted to work on their clients’ hair. Nail techs, estheticians and eyebrow artists spend the day bent over their clients, with their necks and shoulders crouched downward. Yoga has exploded in popularity with beauty professionals over the past few years, and for good reason. It not only helps keep your breathing and anxiety level in check, but it teaches you how to counteract the physical stresses that are placed on your body too. Here are a few tips, rooted in yoga, to destress, relax overworked muscles and reset your posture. Yoga teaches you how to become aware of the sensations in your own body. Learn how to listen to the signals that your body is sending to you. Are you clenching your jaw because you’re feeling stressed? Can you feel tightness in your upper back after servicing a few clients? Is your lower back stiff after standing all day? These are all signals that your body is in need of a little TLC. It’s easy to miss these signs if you’re not actively listening for them. Make it a point to pause every few hours and check in with your body. There’s something magical about pausing for a few minutes to practice deep breathing. Not only is deep breathing a great stress reliever, but it also helps to create space within your body and stretch the ribcage. It’s also a moment that you can take for yourself to put aside all of the distractions from the day and focus on how your body is feeling in that moment. Simply close your eyes, inhale slowly for 5 seconds and completely fill your lungs with air, hold for 5 seconds, then exhale completely for 5 seconds. Repeat this for a few minutes. Movement is healing, and yoga poses help to loosen overworked muscles and restore movement to stiff joints. Here are a handful of yoga poses that focus on restoring flexibility in the spine, counter-stretching the back muscles and loosening tight hips. 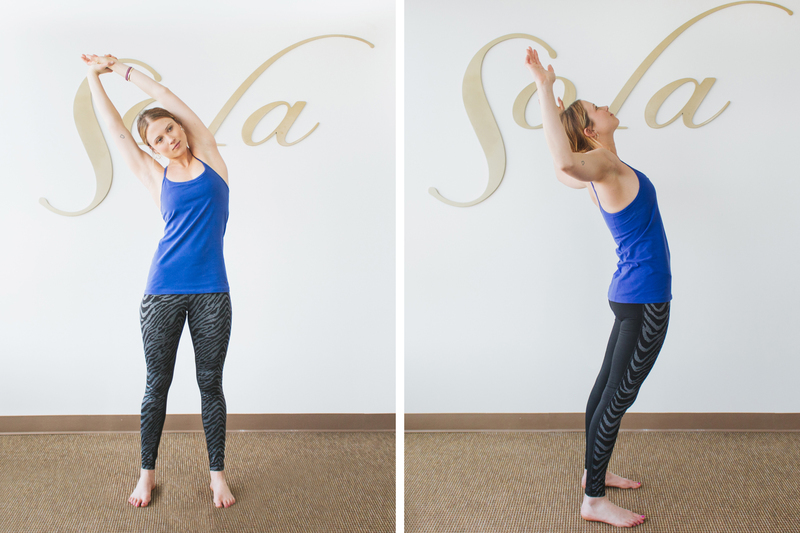 Best of all, you can practice these postures from within the privacy of your Sola studio at the first sign of muscle tightness! Stand with your feet hip-width distance apart. Reach your arms straight above your head and relax your shoulders away from your ears. On an exhale, capture your left wrist with your right palm, and reach over to the right side. Hold for a few breaths. On an inhale, come back to center, and switch out your grip. Reach and stretch to the left. Hold here for a few breaths, and come back to center on an inhale. Exhale, and lift your chest to find a mini-backbend. Breathe here, and come back to center when you feel ready. Stand with your feet hip-width distance apart. Fold forward with a straight back. Bend your knees if necessary to keep your back straight. Let your head and neck relax, and grab your opposite bicep with opposite palm. Balance your weight into the balls of your feet. Hold here for a minute or so, and sway from side to side if it feels good. Start in a standing position with hands at heart center; bend your knees, balance onto one foot, and stack your opposite ankle on top of your standing thigh. Flex through your lifted foot, and draw your weight back into your standing heel. For a deeper stretch, rest your palms on the ankle and knee of your lifted leg. Breathe for 30 seconds, and switch sides. Your hips will thank you! Begin on your hands and knees. Reach your chest forward and pull your shoulders back. Look up to the sky take a big breath in. Then round your spine, draw your shoulders together and down and bring your forehead toward your chest. Squeeze your knees into your chest, and extend your left leg to the floor. Draw your right knee in toward your right armpit, and twist to the left, stacking your right hip on top of your left. Press your shoulders down, and gaze toward the ceiling, or to the right for a deeper twist. Come back to center, and switch sides. Beauty professionals are famous for maximizing their schedules, and typically putting their clients first. But now that you’re a salon owner, make sure you’re scheduling a few minutes of downtime between clients to reset, relax and rejuvenate. Your clients will thank you for the fresh mentality and positivity that will result from you feeling your best!